With a new series of Doctor Who comes an opportunity for BBC Books to extend their new branding to their range of Doctor Who novels and the first three to feature the new team of Amy Pond and the Eleventh Doctor hit the shops at the end of April. As well as the swishy make-over you'll also notice that these hardbacks are a bit bigger than their earlier counterparts. 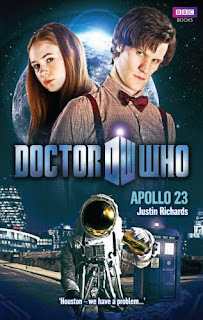 First up is Apollo 23, written by the range's consultant Justin Richards. It's apt that Richards seizes on Matt Smith's own Troughton-esque performance by setting his story in those very environments that the Second Doctor himself would feel completely at home in - top secret moonbases and military-industrial complexes. It begins with a wonderfully surreal set of images, a fully suited astronaut popping into existence in the middle of a shopping centre and a woman suddenly walking her dog on the moon. Coincidentally, Amy and the Doctor are doing a spot of shopping right at the moment both events occur and dive in to investigate the problems with an instantaneous form of travel and how the malfunctions form a prelude to a sinister alien invasion. Richards tale picks up a brisk pace, lovingly paying homage to creepy space bases, name dropping T-Mat into the bargain as he gets the Doctor tinkering with the 'quantum displacement' method of travel between Earth and the Moon. Revealing that several secret Apollo missions were continued to create the lunar installations ushers in a genuine affection by Richards for the demise of the 'space race' of the late 1960s and early 1970s and rekindles memories of those early scenes in Troughton's The Seeds Of Doom as well as reflecting Doctor Who's 'alternate future history' - you know, the one where Britain still has a space programme. A mention of the British Rocket Group is enough to remind you of the Quatermass vibe of well intentioned scientists and generals as playthings of evil alien forces. Even The Mind Of Evil's Keller gets a mention and there are lovely echoes of The Invisible Enemy when the Doctor and Amy discover that the moonbase is a facility for brainwashing convicts with a process that unwittingly allows aliens to possess their minds. It's a solidly written, fast moving romp, with a few neat little twists along the way and a healthy sense of paranoia about who is and isn't possessed by the aliens, set on the high frontier of space exploration. Richards manages to pick up on some of Matt's little physical and vocal mannerisms as the Doctor and Amy's fierce sense of independence and her fearlessness but atypically it doesn't embrace the oft referred 'fairy tale' tone that the series is currently trying hard to develop. David Llewellyn's Night Of The Humans is elegantly written with a lyrical prose style that evokes tangibly the world and characters he's created. The bizarre notion of a space body created by piles of junk has that mix of Tim Burton, Roald Dahl and Oliver Postgate that the new series has started to emulate and throws in a Dan Dare and Eagle Comics sensibility too. Thematically, with its story of human survivors from a crashed cargo ship devolving into blind worship and fear of technology and those who use it, with a society shaped by old Western films, reminded me of the futurist medieval trappings of State Of Decay and Face Of Evil. The Doctor and Amy land on the Gyre, a world created, by gravitational forces, out of rubbish and junk, to discover aliens, the Sittunn, on a mission to destroy the Gyre with a nano-bomb before a huge comet strikes it and sends chunks hurtling into the nearby densely populated planets. However, they've encountered a group of regressed humans, the descendants of the crew of a cargo vessel The Herald Of Nanking, who have ignored their warnings and attacked and killed most of the expedition because they believe their God, based on the image of a clown used in the cargo company's branding, will save them from the comet. Look out for Amy and the Doctor's slight embarrassment at their high five scene because it is one of many little moments where Llewellyn tunes in beautifully to their relationship and to Matt and Karen's interpretation of it. The book ends on a gorgeously bittersweet note that underlines the Doctor's fallibility too, echoing the similar introspection at the end of Victory Of The Daleks. 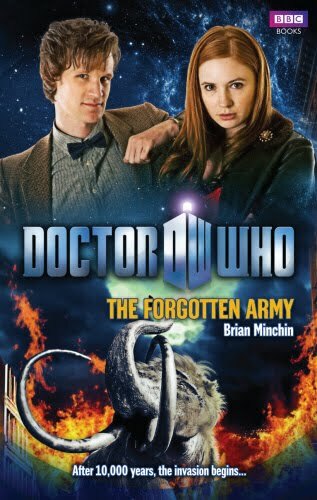 Finally, we have Brian Minchin's The Forgotten Army. Again, similarly to David Llewellyn's book, Minchin has seized upon the series espoused surreal, fairy tale quality with this story. Of all three writers, I feel he really gets the Doctor and Amy absolutely spot on. He's particularly good at capturing Amy's feisty independence and the character really does come off the page. By the time I'd got to this book, I was happy that all three authors had passed the ultimate test - clearing hearing Matt's voice in the dialogue and scenes featuring the Doctor. On a visit to New York (to taste the best hamburgers in the universe along with several other alien diners in disguise), the Doctor and Amy are dragged into a strange incident at the Natural History Museum where an apparently dead mammoth has come back to life and is running amok amongst the exhibits. When the mammoth is captured and isolated in Central Park Zoo, the Doctor discovers that the creature is in fact a spaceship housing a miniature alien army, the Vykoid, planning an invasion of the Earth. The whole notion of an alien invasion conducted by a tiny alien race using a spaceship disguised as a woolly mammoth just conjures up the wonderful Lilliputian satire of Swift's Gulliver's Travels and the homespun adventures of Mary Norton's The Borrowers. As the vicious little army emerges and attacks Manhattan, they even have a tea break on Amy's knee. And if you thought the Star Whale was a peculiar thing to have floating around in space Minchin takes absurdity to a new level with the tale of the rather smelly Space-Boars and the potential fate of the human race. With the Doctor carted off by the Vykoid army (impossibly, like a gang of army ants they manage to carry him over a fence) it's down to Amy to save the day and stop the Vykoid from enslaving the human race. There's a great chapter where Amy only has a police officer, Oscar, to help her try and rescue the Doctor and the sparkling dialogue is quintessential Amy - funny, brave and reckless. As daft as this entire scenario might seem, especially with NYPD's finest controlled like puppets, mammoths galloping down Broadway and the world being saved by a pretzel, somehow Minchin makes it all work and turns in a rather charming, often hilarious, book about freedom from slavery and the potential of the human race. Cathode Ray Tube has a set of all three new Doctor Who books, courtesy of BBC Books and Ebury Press, to give away. The winner will be contacted by email. The books will be posted within 5 days of the competition closing (unless delayed by postal strikes). Question: Which famous astronomer and broadcaster appeared in the The Eleventh Hour, the first episode of the new Doctor Who series? Great reviews. I've never read the novels and I was thinking of taking the franchise's soft reboot as an opportunity to hop on board, but I think I'd rather go with just one to start. From what you say, they all seem to have their particular strengths, but if you were to recommend one over the others which would it be? I'd enter the contest and hope to win all three, but I'm ineligible. Well, I'd probably go for 'Night Of The Humans'. I really liked Llewellyn's prose style, vivid imagery and the supporting characters. I really enjoyed that on the whole. Best of the three. The others are good but only in parts. Minchin gets Amy absolutely spot on in 'The Forgotten Army' but it's as mad as a box of frogs. Fun, though. If you want something quite trad and straight forward then Justin Richard's book is perhaps the one to go for. 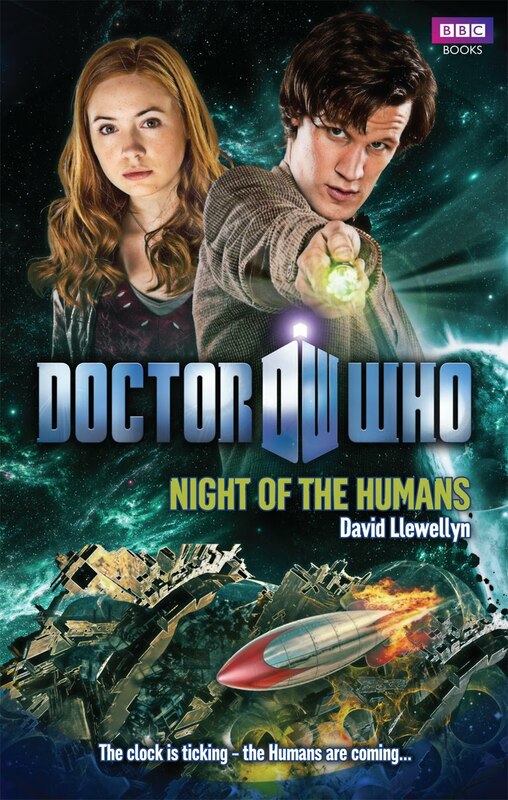 I'd second the recommendation for 'Night of the Humans' as the pick of the bunch - a very enjoyable read.